To be opaque is to be beguiling, provocative. You need to be hooked, of course. But once I’m hooked, I never want everything on a plate. I want to be made to work a little. It is one of the most compelling things about U2’s songs. I think this has been the case since 2004 with 2009’s No Line on the Horizon. But I do also think it is true of Songs of Innocence. My friend Beth Maynard makes a fair point about the album being “specific and rooted and local“. In other words, these are songs inspired by moments, by people, by influences – all of which date back to their earliest times as a band in the 1970s. Thus, they genuinely are Songs of ‘Innocence’ – or perhaps better, songs about an innocence long-lost through maturity (rather than iniquity!). 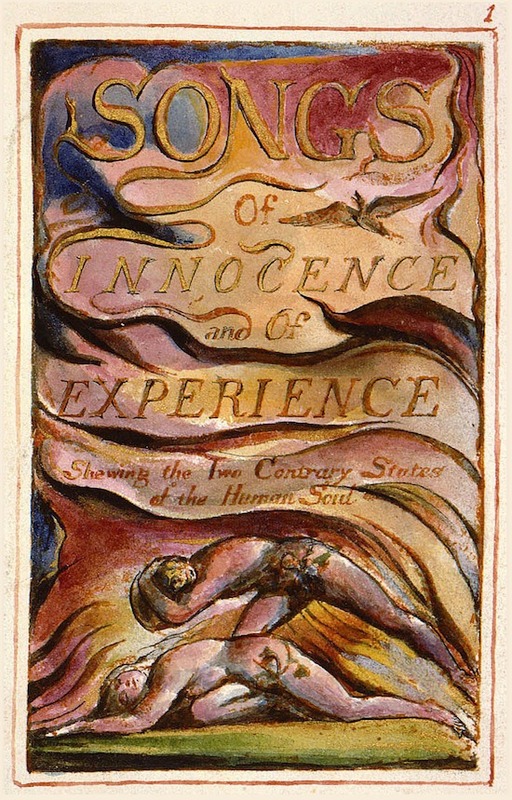 The album’s title is of course a deliberate allusion to William Blake’s Songs of Innocence and Experience – see right – (and we’re promised a companion album called Songs of Experience soon, which I’m guessing will NOT actually be free!). It is genuinely fascinating to me how often music and poetry (for example) can resonate widely precisely because it is specific, not despite being specific. But that is one of the wonders of art and creativity in general. The articulation of something acutely personal by a gifted artist can chime with remarkable universality. But I wonder if we still need to see the alleyways as falling on a kind of relational sliding scale (with specific individual people at one end, and God/Christ at the other end). Beth is absolutely right – it really shouldn’t be ‘news’ that Bono is often addressing God when he addresses ‘You’. And, to my mind, the more opaque the songs get, the more theological they often are. Song for Someone is a case in point. It is the only ‘Song’ on the album. And the anonymous ‘You’, the ‘Someone’ has extraordinary abilities, which seem to go beyond a poetic drawing from the well of biblical imagery. From its gentle opening, it casts the mind back to the start of a lifelong friendship with this person. This ‘someone’ revels in paradox and subversion – it usually takes maturity to appreciate that. It takes a retrospective glance to recognise that the scars, cuts, breakages do not have the last word. Healing is not impossible. A face unspoiled by beauty – but that’s ok – beauty’s hardly the most reliable arbiter of significance. Eyes to see, beyond the visible; a light that can’t be seen, a light even in the dark. A conversation he’s allowed into, but at the same time, his imagination was broken and entered; sounds preteen outrageous, but that’s ok – it’s all ‘yours to take’ anyway. The yearning, the mild anxiety, is that if (and it is a repeated ‘if’) all this is true, this invisible light (whatever that is) might go out. 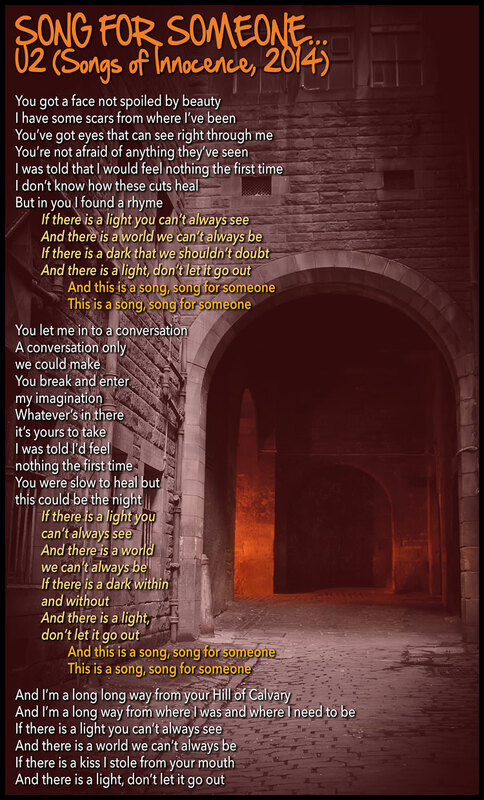 So the song seems to be a kind of aide-memoire for the ‘Someone’ – it acknowledges that they are a long way from where they started out together – specifically from ‘your Calvary’ and from ‘where I need to be’. But in appealing for him not to let the light go out, it is appealing for something perhaps undeserved. Which gets us to the heart of so much of U2’s music. For this song for someone is nothing less than an appeal, a yearning, for grace. Thanks for this Mark. It chimes with something I wrote yesterday about the way reviewers seem reluctant to acknowledge this dimension of U2’s music even when it’s fairly explicit and ‘your Hill of Calvary’ is pretty specific! It’s there in other songs on the album like Every Breaking Wave and The Troubles as well. “(and we’re promised a companion album called Songs of Experience soon, which I’m guessing will NOT actually be free! ).” LOL: Experience never is!